Welcome to the heart of Prince Edward Island – the Central Coastal Region. Everything you need for a fabulous vacation is sandwiched between the vibrant Northumberland Strait to the south and the cradling Gulf of St. Lawrence to the north. If you are returning to our shores, as so many do, you already know that our Island is a treasure trove of culture, history, beauty, nature and adventure. If this is your first time coming “home” to PEI, you are in for a real treat. How does welcome, warm, safe, rejuvenated and enriched sound? Let this booklet and our website centralcoastalpei.com, guide you as you explore everything to love about PEI’s Central Coastal Region. Above all, make yourself at home! We Islanders are authentic – what you see is what you get. So when we say we love company, we really mean it. When it comes right down to it, our “Islandness” is what sets us apart – and nowhere is that more true than in the Central Coastal Region. Sharing a meal that is fresh, creative & visual, in a relaxing ambiant setting is simply the way it should be. In our midst, you will find that your Island vacation is less about what you see and do (although there is lots to fill your days and nights) and more about how you feel. Did you know? You and 1.5 million other folks will visit our Island this year? Not all at once, of course! That’s more than nine visitors for every Islander. Post a photo on social media using the hashtag #WeLovePEI, and be eligible for contests & giveaways between May 1 & October 31, 2019! Toes in the sand. Sunglasses reflecting the rich colours of land and sea. Squeals of delight. Crustacean, cocktail or cone – your craving is satisfied. Take a deep breath of fresh ocean air...and relax. Meet us in the middle and enjoy every moment. We know you’ll find something to love. Victoria Welcome Centre Victoria by the Sea, beside the wharf (902) 658-2572 For Reservations on PEI: 1-800-463-4PEI (4734) or tourismpei.com The area code for all of PEI is 902. While here, visit our neighbours o the West and East. Pick up our guidebook at Visitor Information Centres across the Island. Post a photo from your Island vacation using the hashtag #WeLovePEI, and you could win a prize from one of our operators located in the Central Coastal Region! Visit our website for help with your vacation plans. The publisher accepts no responsibility for the accuracy of material contained herein. 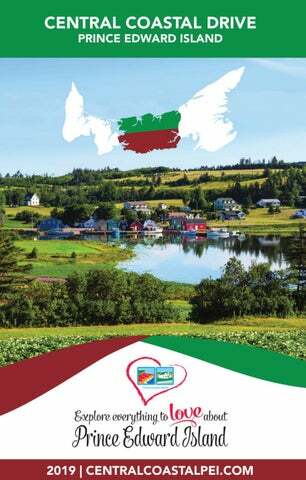 The 2019 Central Coastal Guidebook is distributed free of charge to promote tourism on Prince Edward Island. Design and Production: TechnoMedia Inc., Charlottetown, PEI. Scenic Look Offs! Look for these road signs to follow the Central Coastal Drive along our Red Sands and Green Gables Shores. Please note: Wandering off the drive to explore is highly encouraged. The piping plover is an endangered species on PEI - take care to avoid their nesting habitat near beaches. Unpack your bags, and stay a while at one of our region’s unique properties. The Anchor ‘n Plough Country Home pays tribute to the farming and fishing of the French River area - the owner is a descendant of the former keeper of the New London Lighthouse! Enjoy rural life on an active dairy farm at Parkview Farm Tourist Home & Cottages in Cavendish, or watch a group of happy pigs at the Briarcliffe Inn in Fernwood. Stay at Shaw’s Hotel, adjacent to the longest dune system in the western hemisphere! Sandpiper Cottages and Suites is located just outside of the PEI National Park and a five minute walk to Stanhope Cape Beach. Or relax on the deck at Malpeque Cove Cottages and watch the happenings of the working Malpeque Harbour. Twin Shores Camping Area is celebrating 50 years of business in 2019! Tent it, or stay in a trailer, cottage or cabin. Sweet dreams! Home away from home, with a short walk to the beach! The Sandpiper is perfectly located in one of the most sought after spots on Prince Edward Island! Just outside of the PEI National Park and a five minute walk to Stanhope Cape Beach. Comfortable, clean, two and three bedroom cottages in a quiet country setting. Minutes from the beach, where gentle breezes and sunset to take your breath away! Pet friendly, fully equipped cottages with laundry facilities, free WiFi, indoor common area and a communal fire pit, are just some of the fantastic features we offer. Outdoor adventure on PEI comes in many forms - seadoing at Pier Watersports in Stanley Bridge, horsing around at Venture Stables in Freetown, or zipping 30 feet off the ground at Rise & Climb Adventure Course (Ad pgs. 16 & 33) in Cornwall. By the Sea Kayaking offers bicycle rentals, and many of our accommodations have bike programs as well. And you can rent electric bicycles at the Cavendish Car Wash! Prince Edward Island National Park parkscanada.gc.ca/pei • 888-773-8888 Brackley/Stanhope/Dalvay Gulf Shore Parkway, located off Rte. 15 This area of the National Park provides supervised white sand beaches, picnic areas, washroom facilities, and multiple walking, running, and cycling trails. The Gulf Shore Way is a multi-use trail that runs parallel with the Gulf Shore Parkway between Brackley Beach and Dalvay – a great way to experience sand dunes, salt marshes, and forests. Cavendish/North Rustico Gulf Shore Parkway, located off Rte. 6 Offers white sand beaches, red cliffs, and spectacular views. 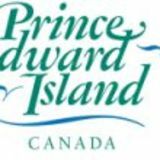 PEI National Park provides walking, running, and cycling trails along with beautiful supervised beaches, picnic areas, and washroom facilities. The Parkway features the Gulf Shore Way, a multi-use trail from North Rustico to Cavendish. Cavendish Grove Across from Avonlea Village on Route 6 Cavendish Grove, part of Prince Edward Island National Park, opened in the summer 2007 as a day-use area. It is named for a large stand of sugar maple trees, a rarity on Prince Edward Island and one of the most significant natural features of the site. Facilities at the newly opened site include a new washroom that uses green technology and a peaceful setting for picnicking and enjoying nature. Skmaqn–Port-la-Joye–Fort Amherst National Historic Site, Off Route 19 Skmaqn–Port-la-Joye–Fort Amherst National Historic Site of Canada commemorates the first permanent European settlement on Prince Edward Island. Grassy ruins of the British fort are still visible, and interpretive displays give visitors an appreciation of the site’s history. The grounds provide an excellent view of the countryside and the Charlottetown Harbour. Sculpt sensational sandcastles at the PEI National Park, or enjoy over 18 kms of river-side hiking and mountain bike trails at Bonshaw Hills Provincial Park. Explore the Island’s interior on the Confederation Trail, an impressive 435 km (270 miles) of flat, groomed surface that runs from tip-to-tip on PEI. Happy exploring! tourismpei.com • 800-463-4734 Argyle Shore Provincial Park Rte. 19. Day use park offering an unsupervised beach, playground equipment, picnic facilities, showers and flush toilets. Pets permitted on leash. Bonshaw Provincial Park Located on the Trans Canada Hwy, Rte. 1. Day use park featuring a playground, fishing and picnic facilities. Pets permitted on leash. Cabot Beach Provincial Park North of Malpeque, off Rte. 20. This beautiful park has a large day use area with playground equipment, activity centre with children’s programs. Supervised swimming on scenic Malpeque Bay. Need a ride to Cavendish or Charlottetown? Chelton Beach Provincial Park Located off route 10 from Bedeque. Day use park featuring playground equipment, supervised beach, showers, flush toilets, and canteen. Pets permitted on leash. Strathgartney Provincial Park Centrally located, on the Trans Canada Hwy, Rte. 1, 20 km West of Charlottetown in Churchill. One of the most beautiful scenic views of all the Provincial Parks with self-guided nature trails, playground, kitchen shelters, and washroom Facilities. Inman Memorial Park (Canoe Cove) Rte. 19. Shelter & picnic area. Facilities. Beach. Point Deroche (Blooming Point Beach) Blooming Point Road, off Rte. 2. White sand beach. Unsupervised. No facilities. Victoria Beach (Victoria by the Sea) Rte. 116. Red sand beach. Play area. Unsupervised. Facilities. Relax, let us do the driving! Step into the story! For an extra special experience, consider taking in “A Cordial Visit”! Faites partie du récit! Pour une expérience encore plus extraordinaire, pensez à nous rendre « Une visite cordiale »! Marilla’s Table Culinary Class and Anne’s Picnic Experience The Table Culinary Studio (New London) thetablepei.ca • (647) 920-1542 Painting Montgomery’s Island with Ruby, Emerald and Sapphire Julia Purcell Art Studio (Clyde River) juliapurcell.ca • (902) 368-7526 Raspberry Cordial Find at COWS Ice Cream locations, or at a number of cafes and convenience stores across the Island. Site of Lucy Maud Montgomery’s Cavendish Home (Cavendish) lmmontgomerycavendishhome.com (902) 626-1784 Fans of the Kevin Sullivan films of Anne of Green Gables Some Island locations where scenes were filmed: Orby Head – on the Shore Road in the National Park, a few miles from Cavendish. The scene in which Anne and Diana are standing on a cliff overlooking the Gulf of St. Laurence was filmed here. A parking area is available. Rustico Bay – a few kilometres east of Cavendish. Scenes were filmed along Highway 6 overlooking the bay, lighthouse, and fishing houses. Dalvay-by-the-Sea – the hotel used to represent the “White Sands Hotel” in the Anne films as well as in the Road to Avonlea television series. It is about 20 miles east of Cavendish. There is a wonderful dining room here, serving lunch and dinner as well as afternoon tea. Sea Cow Head Lighthouse – in the Red Sands Shore, a few miles west of the Confederation Bridge (see Fernwood on Highway 119 on the PEI road map). Make Prince Edward Island’s North Shore the setting of your next adventure. Faites de la rive nord de l’Île-du-Prince-Édouard le cadre de votre prochaine aventure. The Central Coastal Region is filled with talented craftspeople, eclectic creatives, and artistic spaces that inspire. Artist Karen Gallant is inspired by the elements and rhythm of the Islands’ landscape, people, nature, and local stories. Find paintings, prints and more at her art shop on the second floor of her family’s country store in Rustico. Featuring antiques from England, France, Canada and the USA. Fine china, crystal, sterling silver, books and other collectibles. Continue on to Clyde River, where you’ll find artist Julia Purcell’s studio gallery nestled in a private garden setting. Begin your fascination with watercolor painting with “The Joy of Watercolour Painting” Workshop or “Paint Montgomery’s Island” Workshop, in the company of an experienced artist and teacher. Explore even more art galleries, craft shops, visual artists and artisan studios in the Visual Arts section of the PEI Arts & Heritage Trail at artsandheritagepei.ca. And look for giant quilt boards on buildings, used to designate Arts & Heritage Trail participants. An Island symbol, the quilt speaks strongly of our creative heritage. Confederation Trail The area code for PEI is 902. Map indicators are approximate locations only. North Carleton: Across from St. Peter’s Roman Catholic Church. Look over green surrounding countryside down to the bridge. From here is a view of its entire 13-kilometer span. Rte. 10. MacQuarrie Road: At the end of the road is a parking area where you can walk to the shore to view a completely different perspective of the bridge. Off Rte. 10. Chelton Beach Provincial Park: The park, with its red sand beach and warm waters for swimming make a fine place for enjoying a respite from a hurried life. The surrounding vistas of the bridge provide the perfect backdrop. Off Rte. 10. Gateway Village Information Centre: Here, take an opportunity to relax in a comfy leather chair and watch a 20-minute video about how the bridge was built. Then get an up close and personal look at one of the bridge piers, located next to the centre’s parking area. 100 Abegweit Drive, Borden-Carleton. Seacow Head Lighthouse – Fernwood: Low spiky spruces line the shore on the right of the lighthouse while the cliffs provide an excellent viewing platform. Spectacular panoramic view of the Bridge from PEI all the way across to New Brunswick. Rte. 119. Marine/Rail Historical Park: Here, you can actually touch the bridge. The site features a lighthouse, observation deck, and tribute to the men and women who worked on the bridge. Borden Avenue, Borden-Carleton. Family time has never been so exhilarating! Surf’s Up! This swirling, twirling surf coaster resembling a giant surfboard is sure to delight and excite both kids and young-at-heart at Shining Waters Family Fun Park in Cavendish - it’s just one of 40 wet and dry attractions found at the property. Spooktacular fun can be found in Kensington as visitors tour the Haunted Mansion as startling surprises pop out of the woodwork and have you screaming in fright. Your heart will continue to race as you try the spooky new Zombie Apocalypse after-dark adventure at Crossfire Adventure Paintball in Cavendish as you wander through four acres of movie quality apocalyptic wasteland! Take in a blockbuster on the big screen at the Brackley Drive-In... a nostalgic experience under the stars for 60 years this summer! Whether it’s carefree family time, just the two of you, or all your friends, you can relax and enjoy the show. • Parasailing - featuring dry take-off & landing • Sea Doo Rentals - add memories to your vacation • Kayaking - fun for everyone • Paddle Boards - latest craze on the water! From farm fresh fare to locally made sweets, treats and eats; chowder trails to deckside delicacies, Prince Edward Island has declared itself as Canada’s Food Island! At the Pearl Eatery in North Rustico, Chef can be seen collecting herbs and edible flowers from the garden just off the kitchen door, while farmers, fishers and foragers come and go, leaving a bounty of local ingredients from which the menu evolves. Try the Station Wings at Island Stone Pub, located in Kensington’s former train station. Chez Yvonne’s Restaurant in Cavendish serves up the best roast turkey dinner on PEI every Sunday, and you’ll be hard pressed to find a lobster roll better than the one offered up at the Lobster Barn in Victoria by the Sea. Famous “mile high” lemon meringue pie? Oh my! Find it at the New Glasgow Lobster Suppers. BBQing at your vacation cottage? Find the freshest lobster, mussels and oysters available at Basin View Seafood, a fourth generation fishing family. And locals rave about the soft, flakey rolls found at the New London Community Complex Bakery, Cafe & Events Centre. Relax and let Hop|Sip|Swirl Tasting Tours do the driving on an outing to explore the Island’s best wineries, breweries and distilleries. HOP|SIP|SWIRL your way through Canada’s Food Island, with the ultimate in fully-arranged, private escorted tours. Our one of a kind premium Tasting Tour showcase’s Prince Edward Islands finest artisanal Craft Beer & Cider Brewers, Vintners, and Distillers. FARMERS’ BANK OF RUSTICO A National Historic Site, Rustico is one of the oldest communities established in “La Nouvelle Acadie” following the Treaty of Paris in 1763 and is the oldest Acadian settlement in Prince Edward Island. Did you know that Prince Edward Island has more golf courses per capita than anywhere else in Canada? Just 20 minutes east of the Confederation Bridge & 10 minutes west of Charlottetown, find the Clyde River Golf Club - enjoy natural terrain, outstanding water views, and PEI’s only island green! In Red Sands Shore, find Countryview Golf Club, in the rolling hills of Fairview with views of the West River. Golfers can expect consistent and true greens, lush fairways with a challenging course layout. After a refreshing round, relax with a meal or a beverage and enjoy the panoramic deck found in the Greenside Bistro. To help plan your ultimate PEI golf getaway, visit golfpei.ca. Many of our accommodation operators offer golf packages - visit Places to Stay on page 10 for options. Charlottetown Festival at the Confederation Centre of the Arts June 28 - September 28, 2019 145 Richmond Street, Charlottetown • confederationcentre.com • 1-800-565-0278 A fiery redhead. A grieving son. A gregarious family on the Rock. The musical pull of the Atlantic. A young woman’s search for family. Sit a spell. Has the Confederation Centre of the Arts got a story for you this 2019 Charlottetown Festival season! The Festival will commence June 28 with the much anticipated return of Kronborg–The Hamlet Rock Musical. The Festival’s crown jewel Anne of Green Gables–The Musical™ will return for its 55th consecutive summer. And back to the Centre by popular demand, it’s Mamma Mia! Over at The Mack, the Festival is thrilled to welcome Tara MacLean’s Maritime love-letter, Atlantic Blue. From July 20 through September 28, Spinning Yarns will shine a light on Newfoundland in the early ‘80s: a world of raucous adventures, death defying escapades, and dubious childcare! The Festival, now in its 24th year, includes the best in folk, jazz, blues, roots, classical, choral, traditional and contemporary music all in the acoustically perfect Historic St. Mary’s Church in Indian River, Prince Edward Island. The lineup of artists for 2019 Indian River Festival summer season includes: Jeremy Dutcher, Tracy Cantin,The Once, Brett Polegato, Catherine MacLellan, VC2 Cello Duo, David Myles, Ironwood Quartet, The Fretless, French Squeeze, Rose Cousins, Indian River Festival Chorus, The Small Glories, Saskatoon Children’s Choir, Dmitri Levkovich & Agne Radzeviciute, Scandinavian String Alliance, Lina Boudreau, Pro Coro, Shari Ulrich, Bach Sonatas with Mark Fewer & Hank Knox and MORE! Doors open one hour prior to concert time and everyone is encouraged to arrive early, enjoy a drink and conversation in the pavilion, then relax and find out why everyone says Music Breathes Here! The historic Victoria Hall, located at the exact centre of the village is home to the Victoria Playhouse Inc. The Hall has been at the heart of the community for over one hundred years and continues to bring people together, from near and far, to share in the magic of live performance. If laughter is the best medicine, you’re going to want a double dose of these two hilarious and heart-warming Canadian comedies as part of the 2019 season at the Victoria Playhouse. From June 25-July 28: Where You Are, Kristen Da Silva’s brand new play, is a touching comedy that celebrates finding love... and recognizing it when you do! August 6-September 1: From Canadian comedy queen Allana Harkin, Real Estate is an engaging and funny look at the process of picking up the pieces and moving on. September 11-16: Back by popular demand - Fascinating Ladies, the hit musical revue of 2018! Fascinating Ladies is a celebration of the great girl groups and famous female artists of the 20th century. The popular Musical Mondays Concert Series is back for 2019 – visit the website for details! Victoria Playhouse Festival Where Islanders Go! June 25 - August 31, 2019 57 Church Hill Avenue, North Rustico • watermarktheatre.com • (902) 963-3963 Fasten your seat belt for a non-stop ride that will take you up, up and away! Boeing Boeing is a riotous farce about a successful architect named Bernard who is juggling three flight attendant fiancées – an American, an Italian and a German. Unexpected schedule changes bring all three to Paris, and Bernard’s apartment, at the same time. A non-stop comedy and a romp of international proportions. Warm-hearted, irreverent, zany and brilliantly imaginative, Crimes of the Heart teems with humanity and humour as it examines the plight of three young Mississippi sisters betrayed by their passions. With warm-hearted laughs and touching family moments, the sisters forgive the past, face the present, and embrace the future in this contemporary American stage classic. For the 2nd year in a row, the Play Reading Series will showcase new work in development by PEI playwrights. Three new, unpublished, and unproduced plays will be chosen and read by the Watermark’s company of actors during the month of August. The Classic Music Reignited series returns, curated once again by Rob Oakie. As always, Island musical artists interpret classic composers in a way that you have never heard before. July 5-7, 2019 • cavendishbeachmusic.com What was once a cow pasture in Cavendish, Prince Edward Island, is now the home of the largest multi-day outdoor music festival in Atlantic Canada – the Cavendish Beach Music Festival. 2019 will bring Carrie Underwood, Eric Church and Hunter Hayes to the north shore. PHOTO: NORTH SHORE SURF CO. The fall is also a great time to pop into artisan studios, visit antique shops and participate in a hands-on workshop or culinary adventure. Check out the plethora of experiences available on page 30. Are you anticipating the holiday season? The small village of Victoria by the Sea hosts an annual Victoria Village Christmas Stroll in October. Businesses are decorated, find music in the streets, and start your Christmas shopping at craft vendors at various venues throughout the village. Bonshaw Hills Provincial Park The main trail was named Ji’ka’we’katik Trail - after the traditional Mi’kmaq name for the West River. Ji’ka’we’katik (Pronounced - Jih Ga Way Ga Dig) means “the place where bass are plentiful” in Mi’kmaq. Skmaqn–Port-la-Joye–Fort Amherst Originally established by the French in 1720, Skmaqn–Port-la-Joye–Fort Amherst commemorates the first permanent European settlement on Île Saint-Jean (today Prince Edward Island). After falling to British forces in 1758 it became the site of a major deportation of French and Acadian settlers. A Grand Alliance was forged here between the Mi’kmaq and French - one of only two locations in North America where this was celebrated annually with speeches, gifting and feasting. The fort’s grassy ruins are still visible, and interpretive panels explore its rich history. The grounds also offer superb views of the surrounding countryside and Charlottetown Harbour. Coffee Comfort Vacationing on Prince Edward Island will definitely fill your cup. We have lots of great spots to get your travel mug filled too! Whether you need a flavoured latte, or a foam-covered frappe (or a simple drip coffee), Samuel’s Coffee House in Cavendish’s Avonlea Village can keep you well caffeinated. Also in Cavendish, the all new Seaside Café at Mariner’s Cove Boardwalk will be serving Starbucks coffee, espressos, blended drinks, teas and cold beverages, including Frappuccino’s. Staying at Twin Shores Camping Area in Darnley? You’ll be able to enjoy their Twin Perks Cafe, serving coffee, espresso, sandwiches and baked goods. On the Red Sand’s south shore, stop in to Island Chocolates in Victoria by the Sea for one of their famous Factory Coffees...a warm Belgian chocolate-lined glass, fresh coffee, topped with real whipped cream. It’s as delicious as it sounds. June - September Share your chowder journey at #PEICHOWDER for a chance to win some Island prizes! Haunted Mansion A Fun Time Family Scream Park! Halloween � Nights of Fear!